Since opening to huge acclaim in 1999, the Ángel Gallardo and Neil Coles MBE designed course has been one of the most talked about golf experiences in continental Europe and has consistently won praise and awards including, most recently, the ‘Best Golf Course in Spain’ at the 2018 World Golf Awards. The course provides constant challenges for all true golf lovers, with each hole presenting a different test of skill thanks to a strategic combination of lakes, bunkers, tee boxes and huge greens encouraging player-concentration throughout the round. The superb natural landscape surrounding the course gives players extra golfing enjoyment, especially at the signature 13th hole, commanding wonderful views of the Pyrenees’ dominating Montseny Massif. The pedigree and appeal of The Stadium Course has also continued to attract major tournaments, including The Sarazen World Open in its inaugural year (won by 2018 European Ryder Cup Captain, Thomas Bjørn) and three Open de Españas, the first in 2000, won by Spanish legend, Miguel Ángel Jimenez. 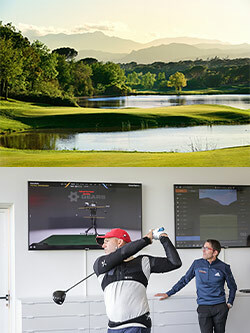 Also home to the Tour Course, PGA Catalunya Resort boasts some of the finest practice facilities in Europe, including The Golf Hub (opened by former Masters Champion, Sergio Garcia, in 2018) an academy that integrates the latest state-of-the-art golf ball tracking system with social gaming experiences to be enjoyed by the whole family. Over the next few years, a further €20 million will be invested into new projects on the estate, which will include the creation of a recreational lake, with its own lake club and a variety of water sports, as well as a comprehensive new spa and wellness centre. Among its wealth of current golf, leisure and lifestyle facilities, PGA Catalunya Resort boasts two on-site hotels: the five-star Hotel Camiral, where guests can find a consummate luxury experience with several dining options, extensive fitness and wellness facilities, and a comprehensive concierge service, as well as the contemporary and stylish LAVIDA Hotel, opened in 2018. The European Tour Destination is just an hour north of Barcelona, 20 minutes’ drive from the glorious sandy beaches and rocky coves of the Costa Brava, and boasts one of the highest concentrations of Michelin starred restaurants in the world on its doorstep. What’s more, Girona-Costa Brava Airport is just 10 minutes from the resort, with Barcelona-El Prat International Airport (70 minutes) also providing easy access from across Europe, ensuring golfers from the UK and Ireland, Germany, Scandinavia, The Netherlands, France and Italy can enjoy one of Europe's finest golf venues. Opened in 1999, PGA Catalunya Resort quickly established an international reputation for outstanding quality. The Stadium Course is ranked the number one golf course in Spain by the www.top100golfcourses.com website. PGA Catalunya Resort is ranked the number one resort in Spain by Golf World magazine, which also recognises the venue in its World Top 100 Courses. The 36-hole resort also offers two accommodation options – Hotel Camiral, a member of The Leading Hotels of The World and Girona's only 5* hotel, and LAVIDA Hotel, aimed at the active traveller. In addition, the European Tour Destination comprises a discreet, low-density real estate development, with first-class leisure facilities and a select number of villa plots, stylish modern semi-detached villas, and luxury apartments. Conveniently situated close to Girona-Costa Brava Airport (five-minute drive) and Barcelona International Airport (one-hour drive), the venue also benefits from the recently completed high-speed train line that links Girona (approximately 15 kilometres from PGA Catalunya Resort) to the rest of Spain and Europe, which provides even faster connections to major cities, including Barcelona, which can now be reached in only 37 minutes.